Enables users to work in both Microsoft Dynamics CRM and Microsoft Dynamics NAV. User can view the data for equivalent records, such as Microsoft Dynamics NAV customers and Microsoft Dynamics CRM accounts from either system. They can work in the application that they prefer and are most efficient in, and make more informed decisions without switching applications. 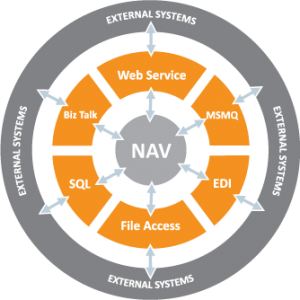 Data can be shared and synchronized between Microsoft Dynamics CRM and Microsoft Dynamics NAV. Changes to records in Microsoft Dynamics CRM, such as accounts, can be copied to corresponding records in Microsoft Dynamics NAV, such as customers. This enables users to keep information up-to-date in both applications. Microsoft Dynamics CRM integration enables you to couple Microsoft Dynamics CRM records with Microsoft Dynamics NAV records. Once coupled, you can access Microsoft Dynamics CRM records from Microsoft Dynamics NAV and, for some entities, access Microsoft Dynamics NAV records from Microsoft Dynamics CRM. You can also synchronize data between records so that data is the same in both systems. The following table describes the Microsoft Dynamics CRM entities that are integrated with Microsoft Dynamics NAV record types (tables) in the default implementation and the supported features.